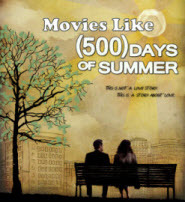 Movies Like 500 Days of Summer '+g+"
Check this list of recommendations for offbeat romantic comedy movies like 500 Days of Summer. It is a nonlinear romantic comedy movie directed by Marc Webb. The story is based on the memories of Tom's (Gordon-Levitt) failed relationship with Summer (Deschanel) who doesn't believe in true love. If you like the movies like 500 Days of Summer then find the recommendations for it below and don't forget to mention if we miss any as we keep on updating this list. During an outrageous memorial for a Southern patriarch, an unexpected romance blooms between a young woman and man. Nick and Norah's Infinite Playlist (2008), if you can think of more, then don't forget to mention it in comments.